Peach Creme Brulee is a super quick and easy dessert recipe that uses just four ingredients. Remember, sugars, salt, water, oil, and vanilla and other seasonings don't count in the four ingredient amount! This recipe is at its finest when peaches are in season. The rest of the year, these simple ingredients turn canned peaches into a lovely treat. It's a great way to get your kids to eat fruit too! You could also make this dessert with canned ​apricots or pears. You don't always need to use the pecans when you make this recipe. Sometimes it's nice to enjoy the slight crunch of the melted brown sugar and the incredible velvety smoothness of the peaches and the sour cream filling. You can also cook this recipe on the grill for a wonderful finish to a grilled dinner. If using fresh peaches, peel, cut in half, and remove pit. Place the fresh peach halves in a shallow glass baking dish, cut side down. Sprinkle with the lemon juice. Broil 4 to 6" from the heat until fruit begins to brown in spots, about 2 to 3 minutes. If you are using canned peaches, you can skip this step. Then, in a small bowl, combine the sour cream, granulated sugar, and vanilla, and mix well. Turn the peaches over and spoon the sour cream mixture generously over the fruit, then sprinkle evenly with the brown sugar. Broil the filled peaches 4 to 6" from the heat until the brown sugar melts and caramelizes. Sprinkle with pecans, if desired, and serve immediately. To cook on the grill, grill peaches, cut side down, for 2 to 3 minutes. 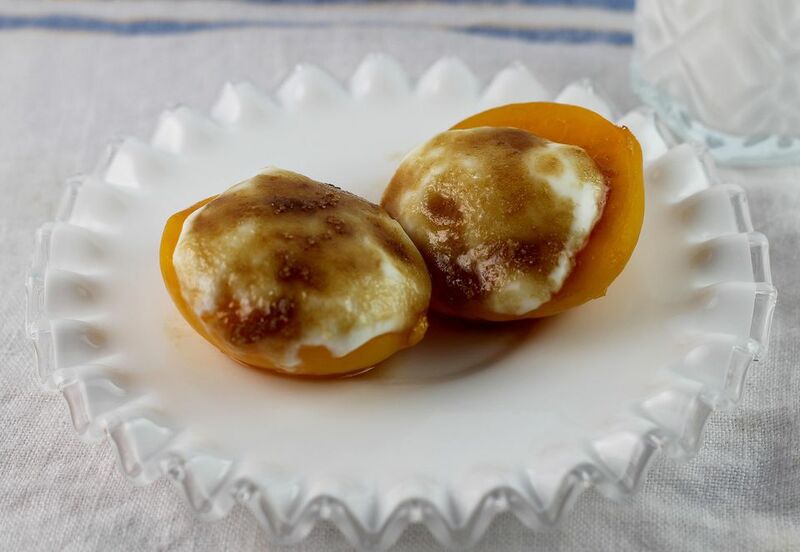 Turn peaches, top with sour cream and brown sugar, and grill for 2 to 3 minutes or until the peaches are hot and the brown sugar is melted.